Which is pretty much what has happened here Dougie Campbell, a former BBC Radio Scotland and Clyde 1 DJ is loking for your help to identify the voices of old soldiers from a tape made in Glasgow nearly three decades ago. The poignant tape has them relating their experiences as soldiers in different theatres of war and as prisoners-of-war. It also records them singing war-time songs, including It's A Long, Long Way to Tipperary and Keep the Home Fires Burning. But their names weren't noted at the time.. The tape was made by Dougie's mother, Elsie, at Flanders House, a former home for ex-servicemen run by the Earl Haig Foundation. The home was later demolished and reopened by Erskine Hospital. Among the mystery voices on the tape, which has never been heard until now, is one man who joined the army in 1915 and after training in England was shipped to France at the time of the blood-drenched battle of the Somme in 1916, where 58,000 British troops were lost on the opening day alone. Later, he added, "I went over with the Argylls at Vimy Ridge and Passchendaele, and I came from there to the Arras front. There was a big German line there and a big German gun-pit. I was with the Gordon Highlanders at that time." 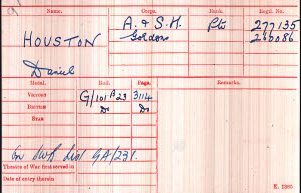 He and a colleague called Danny Houston tried to get into the gun-pit one midnight - but a shell exploded in the pit without warning, and the soldier was badly wounded and brought home, spending six months at Bangour War Hospital near Edinburgh. He was then returned to action on the Western Front, at the Battle of Cambrai, in November 1917 - the first time tanks were used in significant numbers. Another veteran showed Elsie the wound he received at the battle of Mons, in August 1914. "I was captured and sent to hospital, and when I was in the hospital, I was finished. The fact is, when I woke up, they told me I was a prisoner. He was a prisoner for four years at a number of camps, and even worked on a farm belonging to a German major. "We got on well, but there was no food," he said. "Even on the farm, they had no flesh meat, it was always confiscated, so you didn't get fed very much. In the camp, you were fed very badly." Another First World War soldier talks about the Christmas-time football matches between enemy troops in the First World War. And a man who saw service in Holland in the second war said: "I was very lucky, I wasn't wounded at all. The way I'm built, I'm probably hard to hit at the best of times - which is a good thing in battle!"